It’s a story as old and as common as boxing itself. The heavyweight champion on the comeback trail stopping off in some smaller venue far from the lights of Vegas as he tries to build up some momentum for one more world title fight or at the very least one more big payday. Sometimes he’s in the top ten and his promoter just pays a local promoter to put him on a small show as a tune-up. Sometimes he is forced to fight for pocket change just to keep active and hopefully build some momentum. Michael Dokes, a former WBA world champion, once fought a guy named John Morton and was only paid $500 for that fight. But it led to a world title fight against Riddick Bowe so it was a good investment in the long run. Over the course of boxing history these former heavyweight champions ended up in every imaginable venue all across the country. Larry Holmes was a regular in Bay St. Louis Mississippi in the 1990s but also fought in Hawaii during his comeback. Riddick Bowe started his comeback in Shawnee, Oklahoma in 2004. Evander Holyfield stopped by El Paso in 2007 and George Foreman once made a pit stop in Edmonton Alberta in 1990 to fight a guy named Ken Lakusta. And these are the more well known champions…it is even more prolific and common with the lesser known ex-champs. 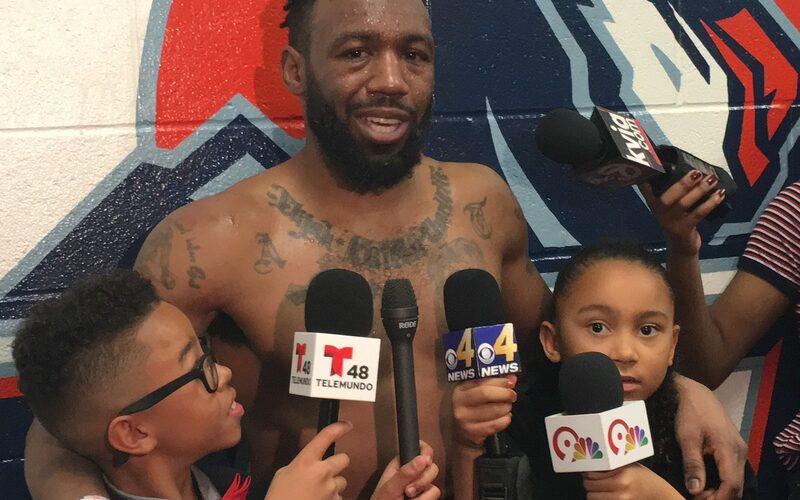 Yeah, a former heavyweight champion fighting in your hometown is a story as old as boxing: it’s like seeing the 90s one hit wonder perform at your county fair. But it’s never happened in New Mexico. That’s right, there has never been a former heavyweight champion on the comeback trail who stopped off in New Mexico as part of his comeback tour. In fact, our history with heavyweight champions is limited at best. We had two future heavyweight champions come to New Mexico on the way up. On August 7, 1982 a young undefeated heavyweight prospect named Tony Tubbs won a ten round decision over fellow undefeated prospect Clarence Hill in Albuquerque. Tubbs would go on to win a decision over Greg Page two year later to win the WBA title, holding onto it for seven months before dropping a decision to Tim Witherspoon in January of 1985. On April 1, 1995 future WBO heavyweight champion Corrie Sanders would crush former cruiserweight contender James Pritchard in the opening round at the Lujan Building in Albuquerque in a fight that was little more than a tune up. Of course on July 4, 1912 we actually hosted a world title fight in Las Vegas, New Mexico which is a lot more than Bay St. Louis or Shawnee, Oklahoma can say. Jack Johnson defeated “Fireman” Jim Flynn in a fight that would give Johnson fans some ammunition in the “who was the greater champion” argument with Jack Dempsey fans. Flynn would be best remembered for destroying Jack Dempsey in the opening round five years after his fight with Johnson. But despite hosting one world title fight in 1912 and witnessing two future champions on the way up, we never saw a former heavyweight champion in New Mexico…the closest we came was then Frans Botha stopped Steve Pannell in the opening round in Albuquerque on January 8, 2000. 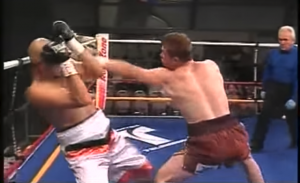 Botha initially won the IBF heavyweight title by way of split decision over German Axel Shultz on December 9, 1995. But that fight was later declared a no-contest and the title declared vacant after Both tested positive for steroids. So, yeah that doesn’t count. But on April 27, 2019, the drought comes to an end. Former heavyweight champion Oliver “The Atomic Bull” McCall (58-14, 37 KOs) will be fighting on a School of Hard Knocks Boxing Promotions show scheduled to be held in Las Cruces at a venue to be announced at a later date. This is really a rare opportunity for boxing fan in New Mexico and West Texas and I say this with all seriousness: we will get the chance to see the fighter with greatest chin in boxing history. That is correct, the best chin in boxing history will be in Las Cruces and he will be in the ring, even if it is at the tail end of his career. McCall turned pro in 1985 (yes, you read that correctly) and in a 72-fight career that saw him fight some of the greatest fighters of his generation he never hit the deck or even really was hurt. In the 1980s and 1990s he earned a reputation as Mike Tyson’s most trusted sparring partner because of his ability to stand in there with Iron Mike and never get dropped. I’ve heard tales of those legendary sparring sessions and the one thing everyone agreed upon was that McCall was so highly regarded by Tyson because of his ability to stand his ground and take the best Tyson had to offer without getting hurt. Let that sink in for a minute. Oliver McCall sparred hundreds of rounds with a young Mike Tyson and never was hurt. Now don’t get me wrong, the 53-year old McCall is well past his prime and I can’t see any scenario where he makes another run for a world title. But although he may not be a world class fighter but he is still a competent fighter despite his advance age. He has only one fight in the last four years (a decision over a journeyman named Larry Knight) and really has never been in serious discussion for a world title fight after his historic meltdown against Lennox Lewis in 1997, when he stopped punching or even protecting himself as he openly cried in the ring. How many fighters could just drop their hands and let Lennox Lewis unload on them and not end up on the canvas? McCall’s run as a contender ended in 2004 when he lost a decision to DaVarryl Williamson but he nonetheless remained one of the toughest gatekeepers in the heavyweight division in the 2000s. From 2010 to 2014 he amassed 17-6 record (with one no decision) which included decision wins over an undefeated prospect named Marcin Rekowski (12-0) in 2014, a win over a borderline contender named Damien Wills (30-2-1) in 2011, a win over Fres “next in line for a WBA heavyweight title fight” Oquendo in 2010, former contender Lance “Mount” Whittaker in 2009, former world ranked contender Frank Lawrence in 2009, former EBU Heavyweight champion and WBC International Champion Sinan Samil Sam (27-3) in 2007, and a win over Shannon Briggs conqueror Darroll Wilson in 2006 for the WBC FECARBOX heavyweight title. Even though all of these wins are quite a few years old, they were part of an interesting trend in the early part of the 21st century: boxing insiders waiting to see if Oliver McCall would finally show his age and if his legendary chin would finally show signs of cracking…and then left waiting. And of course, there is also the fact that Oliver McCall was the former WBC heavyweight champion, having handed Hall of Famer Lennox Lewis his first loss in 1994 in London. Yes, that was almost 25-years ago…but he still remains one of only two men to defeat Lennox Lewis. Even if we don’t see a prime Oliver McCall, this is still a fight worth checking out. Will Oliver McCall finally show his age on April 27th? Will New Mexico fans be the first to see that iron chin finally crack? Hard to say, McCall has proved everyone who assumed he was washed up wrong in the past. But how long can he keep pushing this envelope? 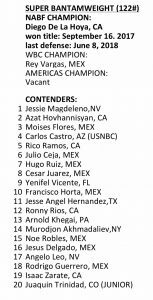 Although the opponent has not yet been formally announced, the names I heard being considered by promoter Isidro Castillo are of some very solid opponents. I can see any of these fighters giving McCall, and boxing fans, a tremendous fight on April 27th. Mark your calendars boxing fans…April 27th in Las Cruces will be a show you don’t want to miss. 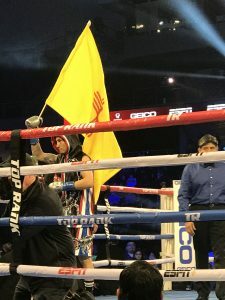 New Mexico’s undefeated world ranked contender Jason Sanchez, 125.4, had his first taste of the big stage as he stepped in the ring with Ixtapa Zihuatanejo Mexico’s Daniel Olea, 125.5, in the third fight of the night. 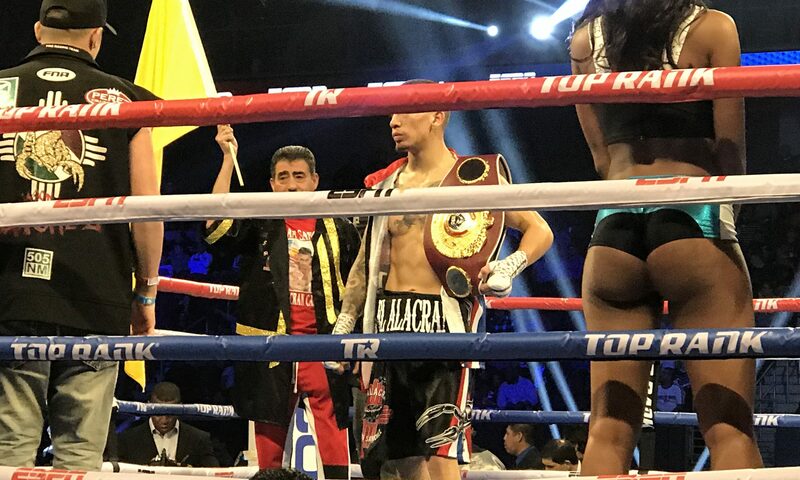 Sanchez boxed well early on but the aggression he showed in Panama City in his last fight quickly emerged when he rattled Olea with a well times overhand right that sent the Mexican back into the corner a minute into the fight. Olea covered up and quickly moved out of the corner but he was unable to keep the Albuquerque native off of him. Sanchez turned into a hunter, stalking his prey, and showed a dazzling array of punches as he mixed up heavy punches upstairs with a solid body attack that had the Mexican doubling over at times. In round two Jason boxed well early on and continued his effective counterpunching as Olea tried to lunge in with looping punches. Although Sanchez did lose his mouthpiece in the second round he maintained complete control of the fight and timed a pictutre perfect overhand right that sent Olea crashing to the canvas. Although Olea rose on wobbly legs referee Gregorio Alvarez waved the fight off at 1:35 of round two. With the win Sanchez improves to 14-0, 7 KOs while Olea drops to 13-7-2, 5 KOs. 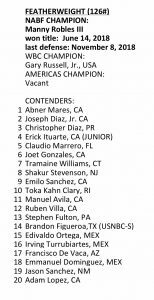 The North American Boxing Federation released their December rankings last week and boxing fans in New Mexico will be pleased to see two of the state’s best fighters ranked by the regional sanctioning body. In the Super Welterweight division Las Cruces’ Austin Trout (31-5, 17 KOs) moves up to #2 in the NABF rankings. The current champion, Carlos Adames (15-0, 12 KOs), is currently scheduled to fight next month against Juan Ruiz. 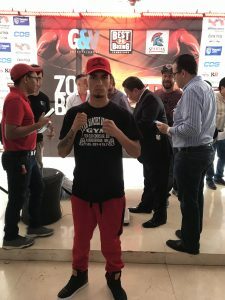 Although it is doubtful that Adames’s management would let him step in the ring against the more seasoned Trout at this stage of his career, it is not out of the question either. For Trout a world title is clearly his first priority, but a NABF title could be just the thing that propels him into a match with newly crowned WBC world champion Tony Harrison. In the featherweight division undefeated Jason Sanchez (13-0, 6 KOs) moves into the NABF rankings at #19. It’s not as noteworthy as the #15 world ranking Sanchez has with the WBO but it is still an impressive distinction. After all, Sanchez never fought for a WBC belt and in fact is the current WBO Youth champion. The fact that he is moving into the NABF rankings despite not fighting for any WBC regional belts means he is attracting attention from a lot of movers and shakers in the sport. Interestingly enough, at #17 in the NABF 126-pound rankings is Phoenix Arizona’s Francisco De Vaca (19-0, 6 KOs). It goes without saying that Southwest boxing fans would love to see the two undefeated prospects square off in 2019. The current NABF champion is undefeated Manny Robles III (17-0, 12 KOs) out of Los Angeles. Our neighbors up north in Colorado also were excited to see undefeated Juaquin Trinidad Camarena (8-0, 8 KOs) of Denver move into the NABF rankings at #20 in the super bantamweight division. Trinidad is the son of Donald Camarena, a talented former contender who once held the WBC Continental America’s Super Lightweight title in 2005. However although Trinidad’s competition hasn’t been particularly outstanding, from what we’ve seen so far Trinidad has a lot of his dad’s boxing skills coupled with some serious punching power. He is certainly a prospect worth keeping an eye on in 2019. Read more Finger Post Boxing News from New Mexico here! 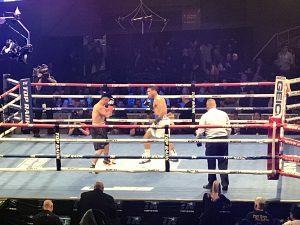 Denver based welterweight Daniel Calzada ultimately came up short in his clash with the talented and undefeated Brian Ceballo tonight at The Hulu Theater at Madison Square Garden in New York City. Calzada showed Ceballo early on why the New Mexican was widely regarded as one of the cagiest fighters in Colorado. Although Ceballo was winning the round with activity he still seemed to have trouble with the defense of Calzada. At times Calzada would successfully move his head to such effect that he had Ceballo throwing three-punch combinations that would hit nothing but air. But in the end the speed and strength of Ceballo was too much for Calzada. By round two Ceballo began to find a home for his right hand, although Calzada showed his toughness in standing his ground. By round three Ceballo was in total control and seemed to snap Calzada’s head back with right hands and left hooks. Still, the New Mexico born brawler refused to take a backward step and certainly impressed the capacity crowd with his grit and toughness. After four rounds of action all theee judges scored the fight 40-36. With the win Ceballo improves to 6-0, 3 KOs while Calzada slips to 16-20-3, 2 KOs. Calzada has only been stopped twice in his 39-fight career. 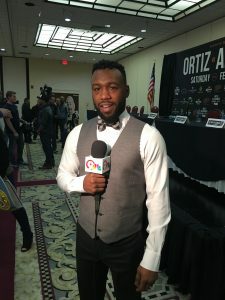 Odessa, Texas may not be a boxing Mecca yet, but if undefeated Texan Desmond “Dez” Hill (3-0, 3 KOs) continues his winning ways that may change in 2019. The Odessa native will fight for the first time in his hometown on December 8th at the Ector County Coliseum and he will do it with boxing royalty watching. The legendary Roberto “Hands of Stone” Duran has been confirmed as a special guest for the Odessa show by promoter Isidro Castillo. Duran, a 2006 International Boxing Hall of Fame inductee, is one of the sport’s most recognizable personalities and is widely regarded as one of the greatest fighters of the 20thcentury. He was perhaps best remembered for his trilogy against “Sugar” Ray Leonard as well as his reign as lightweight champion from June of 1972 to January of 1978. Interestingly enough, Duran’s appearance ringside for the Odessa fight card on December 8th will come 29-years and one day after his third and final fight with “Sugar” Ray Leonard. Leonard defeated Duran by way of 12-round decision on December 7, 1989 in Las Vegas Nevada in one of the sports earliest PPV fights. Although Duran will be available to meet with fans and sign autographs, West Texas boxing fans will nonetheless be excited to also see their native son as he takes his first major step up in class in the boxing ring. Hill, a former MMA fighter and King of the Cage veteran, will take on the cagy veteran Ricard “Rico” Urquizo (4-5-2, 2 KOs) in a four round light-heavyweight fight. Although Urquizo doesn’t possess the flashiest record he has proven to be a more than able gatekeeper in the southwest, who possess a veteran bag of tricks. 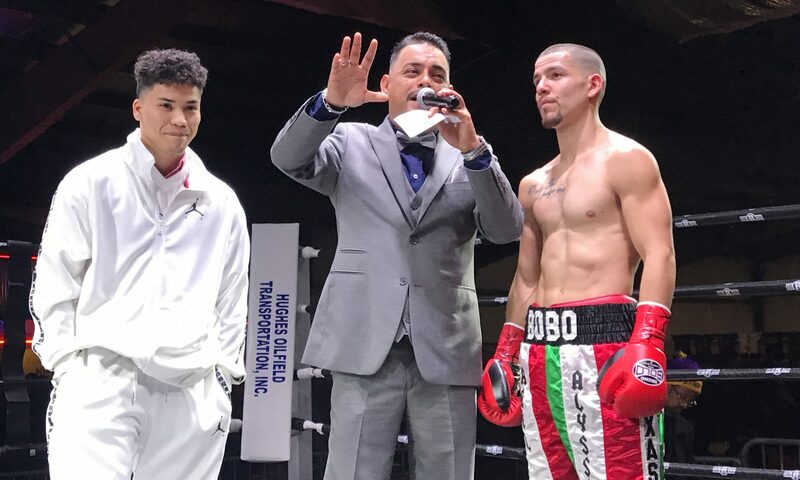 Urquizo has already scored impressive wins over Michael Sanchez and Omar Acosta earlier this year and also challenged for the NABF Junior Cruiserweight title back in July. Although he came up short in his only title fight it still established Urquizo as the most seasoned fighter in the Permian Basin. Nonetheless Hill has shown flashes of brilliance in his three knockout wins and he has many fight fans talking world ranking…assuming he continues to dominate against the next tier of fighters like Urquizo. 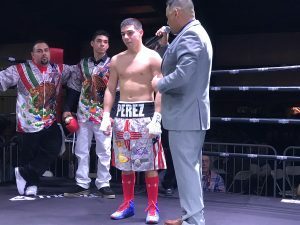 In the co-main event undefeated lightweight Abel Mendoza (11-0, 8 KOs) of Pecos, Texas is scheduled to take on undefeated MExican welterweight Arturo Manriquez (2-0) in a four round fight. Mendoza has looked the part of a world class prospect in his eleven fights…but he has yet to fight a boxer with a winning record and in his last five fights his opponents have a less than stellar record of 8-35-1. Nonetheless matchmaker and promoter Isidro Castillo has earned a reputation in the Southwest of being an able matchmaker who can find gritty and tough opponents for just about anyone, and many are assuming that he unknown MExican will not disappoint when all is said and done. Also rounding off the card will be Roman Huerta Hobbs against Mark Sanchez of Midland in a heavyweight matchup. Both Huerta and Sanchez will be making their professional debuts. Carlos Villalva (1-0) of Seminole will take on rookie Larry Sanchez of Odessa in a four round welterweight fight. Opening the night of boxing will be Jimmy Meza of Odessa as he makes his professional debut against Roswell New Mexico’s Tyler Cole (0-1). The fight card will be promoted by Isidro Castillo and Eric Gutierrez in partnership with Golden Eagle Promotions out of Texas. Tickets can be purchased at the Ector County Coliseum or by calling promoter Isidro Castillo at 1-575-263-4942. New Mexico fight fans will be pleased to know that one of our own is fighting on the undercard of the ESPN televised Lomachenko-Pedraza fight in New York City on December 8th. 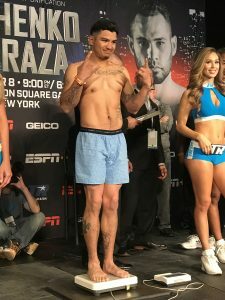 At the weigh in Denver based Daniel Calzada (16-19-3, 2 KOs) weighed in at a ready 147.6 for his four round welterweight fight against undefeated Brian Ceballo (5-0, 3 KOs). Ceballo weighed in at 147.8. Although Calzada lives and fights out of Colorado he was originally from New Mexico and was born in Dona Ana. Albuquerque New Mexico’s Josh Torres made short work of last minute sub Jesus Alvarez Rodriguez, stopping him in the opening round after just 1:16 of action last night. The fight, which took place at the Manuel Lujan Exhibition Hall at Expo New Mexico, was widely expected to be a difficult one for the New Mexican before the opening bell. And when Rodriguez came in at 155.4 (8.4 pounds over the contracted weight) many wondered if the size advantage might be a substantial factor in the fight. But Torres ultimately had little trouble with the former Mexican prospect. With the win Torres improves to 19-6-2, 11 KOs while Rodriguez drops to 15-6, 11 KOs. I’ve covered fights all across the globe and have sat ringside for some of the biggest fights in boxing history…but I think every boxing writer laments the one that got away. And for me that was the night of May 26, 2001. I was just kicking off my career as a freelance boxing writer in Michigan. 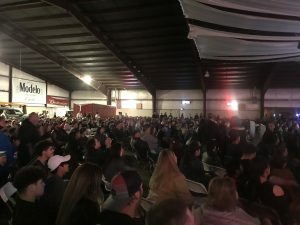 I had submitted some material to a few smaller boxing websites and was 11 days away from covering my first fight card for Fightnews.com: a club show in a VFW hall in Durand, Michigan. (for the record, Fightnews didn’t end up posting it, my first published fight report was from a show in Washington D.C.). But even if I wasn’t a boxing writer at that point I was still a fight fan, which makes May 26, 2001 inexcusable. That was the day that “Pretty Boy” Floyd Mayweather Jr. defended his WBC Super Featherweight title in Grand Rapids, Michigan against Carlos Hernandez of Argentina. I don’t know why I didn’t make the drive out from Flint to Grand Rapids to see that fight. Floyd was already established as one of boxing’s best champions and although he would dominate Hernandez it would prove to be a historic night: the only knockdown of Mayweather’s career (for the record it wasn’t much of a knockdown). I would go on to see Mayweather in action in the future…April 8, 2006, when he won a decision over Zab Judah in Las Vegas. But by then Mayweather was a superstar. In Grand Rapids he wasn’t the most recognizable fighter on the planet yet. Hell, he wasn’t even the most recognizable fighter in Michigan yet. He was talented…we all saw it. But somehow that talent wasn’t enough to motivate me to drive one and a half hours to see him in action live. I guess I just didn’t appreciate how close to greatness I was back on May 26, 2001. And I guess that is why I often pay special attention to those four round fights on the undercard. You never know if that 3-0 kid on the undercard might just be something special. Admittedly they are usually in against a softer touch…but how many of you would say you wouldn’t drive up to Albuquerque to have seen a young Floyd Mayweather Jr. in action, even if it was against a journeyman? Sure the fight featuring that young prospect ends up being pretty lopsided, but you still get to see a young prospect in action…and sometimes that young prospect turns out to be something really, really special. You see the flashes of brilliance…and sometimes you even get to see the rough edges that you know will be polished out before he fights for his first world title. Yeah, I may have May 26, 2001 as my missed opportunity to see greatness rising…but I am not alone. Just about every fight fan in New Mexico has a date they also have to carry with them: November 30, 1996. 22-years ago to the day. Because on that day Floyd Mayweather came to Albuquerque. 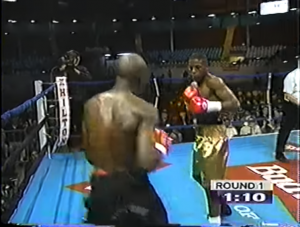 In an ESPN televised fight card featuring then WBO Super Flyweight champion Johnny Tapia in a title defense, Floyd Mayweather Jr. stopped by for a four round clash with a little know journeyman from Indiana named Reggie Sanders. And if you are a fight fans from New Mexico who for whatever reason didn’t go to the Tingley Coliseum on November 30, 1996 then watching the fight now on YouTube will be painful. You will see hundreds of empty seats all around the ring. Sure we didn’t know that Floyd would become “Money” but it doesn’t change the fact that you missed this golden opportunity. You missed a chance to see an all time great in his only fight in New Mexico. Empty seats…as far as the eye can see. And interestingly enough, even though the matchup wasn’t exactly a major test for Mayweather, history was made that night at the Tingley Coliseum. Floyd Mayweather Jr. was taken the distance for the first time. Reggie Sanders was able to last the four-round distance with Mayweather and although judges Levi Martinez and William Gantt had Mayweather winning 40-36, one judge (Sandy Pino, a familiar face to fight fans in New Mexico) actually had Sanders winning one round and scored the fight 39-37. So another bit of boxing history occurred in Albuquerque 22-years ago today and New Mexico fight fans in attendance were able to witness it. Albuquerque saw the first round Floyd Mayweather Jr. would lose as a professional. Admittedly a lot of fans were probably not paying much attention to the then young boxer from Grand Rapids who was fighting as a professional for only the second time in his career. But those who did…well, they witnessed history in the making. They saw the Beatles with Pete Best on the drums. They saw Michael Jordan playing basketball in college. They saw a young Floyd Mayweather Jr. go the distance for the first time ever. And who knows, maybe they even realized they were watching something special. There is a fight coming up this weekend in Albuquerque, and although I won’t claim that any of the fighters on that card will become the next Floyd Mayweather Jr. I have to admit…back in 2001 I didn’t think Floyd Mayweather Jr. would become the next Floyd Mayweather Jr. 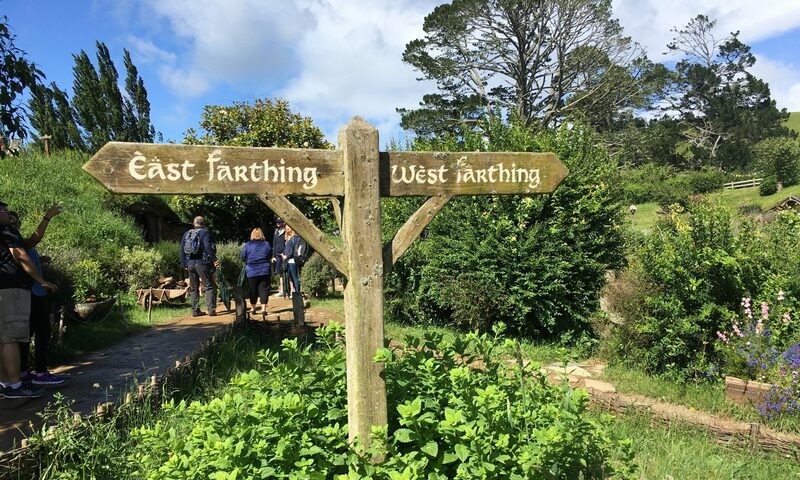 So what do I know? Maybe you shouldn’t take my word for it and you should head down to the Manuel Lujan Building in Albuquerque Saturday night just to make sure you don’t miss something special. A week after that show boxing will head to to Odessa, Texas where a pair of undefeated fighters in Desmond Hill and Abel Mendoza are slated to fight in two separate fights at the Ector County Coliseum. Are either of them the next Canelo Alvarez or Manny Pacquiao? Most people would say no. But those are the same people who didn’t buy these five empty ringside seats for Canelo Alvarez fight agaist Raul Pinzon in Miami back in 2008. Don’t be the five guys not sitting in those seats on Saturday in Albuquerque or on December 8 in Odessa. Well, all I can say is I feel your pain.